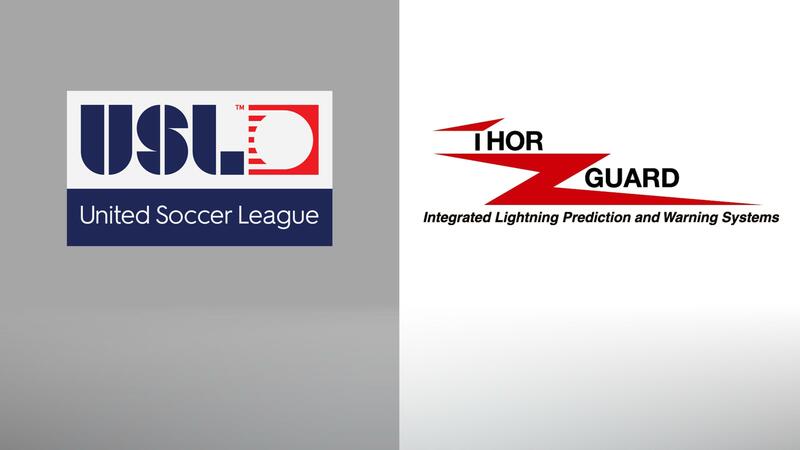 TAMPA, Fla. – The United Soccer League announced today it has entered a multi-year partnership with Thor Guard, Inc., which will make it the Official Lightning Prediction and Warning System Supplier for all related properties, including the USL Championship – the pinnacle of competition – USL League One (formerly USL Division III), USL League Two (formerly the Premier Development League) and the Super Y League. Thor Guard becomes the latest member of the USL’s Preferred Supplier Program, which has grown rapidly alongside the league to provide high-caliber services to the league and its clubs. Thor Guard is the world leader in lightning prediction and warning systems. They are committed to utilizing emerging technologies in the development of systems that provide automatic notification of hazardous weather conditions. Thor Guard is not a detection system, but instead a true prediction system which provides eight to twenty minutes warning prior to lightning striking within two miles. "Thor Guard is honored to be part of the United Soccer League's program for lightning and heat safety,” said Thor Guard President Bob Dugan. “Soccer has become a major athletic activity in America and is growing every day as parents look for an alternative to other more dangerous sports. Thor Guard's role is to provide reliable, state of the art weather related warning systems along with on-going educational programs insuring that everyone involved with the league's activities are experts in all adverse weather-related dangers." The USL will oversee the expansion of an estimated 30–40 new franchises at the second and third divisions of professional soccer over the next five years, which will create opportunities for potential suppliers and vendors to support this growth. Through its Preferred Supplier Program, the USL connects suppliers with new franchise owners and existing USL clubs in order to deliver the best possible experience for fans across North America. Preferred suppliers are “Best in Class” companies that provide services and products to professional franchises and stadium developers and must meet the USL’s strict quality standards. The USL is currently in discussions with suppliers that support stadium development, as well as the buildout of team front offices and operations. For more information on the USL Preferred Supplier Program, contact Josh Keller at Josh.Keller@uslsoccer.com.